The 1811 Independence Movement known in El Salvador as the Primer grito de independencia (First Shout of Independence) was the first of a series of revolts in Central America in El Salvador against Spanish colonialism and dependency on the Captaincy General of Guatemala. At the beginning of the 19th century, agitation grew in the American territories dominated by the Spanish crown. The previous century was dominated by the growing support of ideas of individual freedom, which characterized the Enlightenment that took place in Europe and the Americas. Most influential was the American Revolution, with the resulting liberation of the British North American colonies, and the French Revolution, which seeded the restlessness and search for freedom in the Spanish American territories under dominion of the Spaniards. In the Intendancy of San Salvador (covering roughly the same territory as today's El Salvador), many Creoles and other settlers wanted to separate control of the colony from the Guatemalan Captaincy General. This was largely due to economic and political reasons. Greater administrative autonomy or outright independence for San Salvador would reduce the high level of taxes paid to Spain and Guatemala and would raise finances for the colony. Napoleón Bonaparte's invasion of Spain in 1808 and the removal of Ferdinand VII from the Spanish throne created an atmosphere of unrest in San Salvador. The insurrectionists organized themselves along with prominent middle-class supporters of the cause of independence such as doctors and priests who took part in the event. These included doctors such as Santiago José Celis, the brothers (Nicholas, Vicente and Manuel Aguilar) and the priest José Matías Delgado. Others included Manuel José Arce, Juan Manuel Rodríguez and Pedro Pablo Castillo. The rebels assembled in this town square by the then St. Dominic Church. On November 5 the revolt began in San Salvador. According to tradition, the rebels waited for a signal from the bell tower of the Church of La Merced, but this did not occur on the scheduled time. The rebels later assembled on the town square outside the church where Manuel José Arce proclaimed in front of the public: "There is no King, nor Intendant, nor Captain General. We only must obey our alcaldes," meaning that since Ferdinand VII had been deposed, all other officials appointed by him no longer legitimately held power. A tumult in the square grew to the point that the intendant, Antonio Gutierrez y Ulloa, asked that the gathered name somebody to formally receive their demands. Manuel José Arce himself was chosen and selected as the leader by the crowd. Despite this, the insurrectionists took arms and proclaimed the total independence of San Salvador from the Spanish crown, but were later subdued. In the following days, the independence movement extended to the cities of Santiago Nonualco, Usulután, Chalatenango, Santa Ana, Tejutla and Cojutepeque. The two other notable revolts occurred on November 24 in the city of Metapán and on December 20 in Sensuntepeque. Despite the efforts of the insurrectionists, the cause of independence was not shared by the city councils of the Intendancy . Neither San Miguel, nor San Vicente nor Santa Ana joined them. Unable to amass support, the rebels decided to negotiate with a delegation sent in from the Guatemalan capital to take control. The new Intendant Colonel Jose de Aycinena, arrived on December 8 with Guatemalan troops and priests to force them to swear obedience to the crown and reclaimed the city. The new government was well received by the majority of the population due to Aycinena's policy of understanding and nonconfrontation. However, several days later, unrest broke out in the neighboring Intendancy of Nicaragua, where uprisings broke out in León on December 13 and later in Granada on December 22. Nevertheless, both were soon suppressed. Many of those involved in the events in El Salvador and Nicaragua were incarcerated, but José Matías Delgado was taken back with the delegation to Guatemala City. 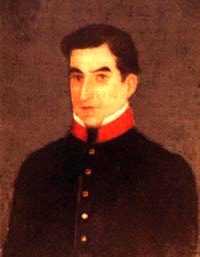 Despite his past activities, or perhaps because of them, Delgado was elected in 1813 as a representative on the Provincial Deputation of Guatemala created by the Spanish Constitution of 1812. He also became director of the Tridentino Seminary in the capital city, therefore, he was not in El Salvador at the time of the second insurrection in 1814, and so did not take part in it. He was once again elected provincial deputy in 1820 when the Spanish Constitution was restored, and on September 15, 1821, he was among those who signed the Act of Independence of Central America in Guatemala City. On November 28, 1821, he became political chief (jefe pólitico civil) of the Province of San Salvador, and as its executive officer, he led its separation from Guatemala to prevent the former intendancy from becoming part of First Mexican Empire. Arce later became president of the Federal Republic of Central America from 1825 to 1829, once full independence from both Spain and Mexico became a reality. In El Salvador the independence movement and 1811 Revolt is officially commemorated every year on November 5 and recognized as the "First Shout for the Independence of Central America". Ministerio de Educación. (1994). Historia de El Salvador Tomo I. Mexico City, Comisión Nacional de los Libros de Texto Gratuitos. Monterrrey, Francisco J. (1977). Historia de El Salvador anotaciones cronológicas 1810-1842. San Salvador: Editorial Universitaria. Vidal, Manuel. (1961). Nociones de historia de Centro América. San Salvador: Editorial Universitaria.